Now that the Afthead lice infestation is officially over, my hands were itching to do something more productive than comb hair. (I spent a lot of time examining my daughter’s afthead, let me tell you!) I wanted to finish something, like my BFF Neil Gaiman encouraged me to do a few weeks ago. The novel is still inching along, but I’ve had a knitting project in the basket since February, and I had Women’s World Cup soccer and Tour de France to watch this weekend. Knitting time! My husband jokes about my knitting and my writing, “You’re so lucky. You’ve already got all your old-person hobbies figured out.” In retaliation I poke him with my knitting needle and make fun of him publicly on my blog. I’m excited about my first knitting blog, because I can try some cross linking between my Ravelry page and my blog. If you aren’t a knitter just look at the pretty pictures and wonder why on earth I’d want to work with a toasty pile of of wool when it’s over 90 degrees out. The pattern is the Chevron Scarf from Last Minute Knitted Gifts, and I used Liberty Wool from Classic Elite Yarns. 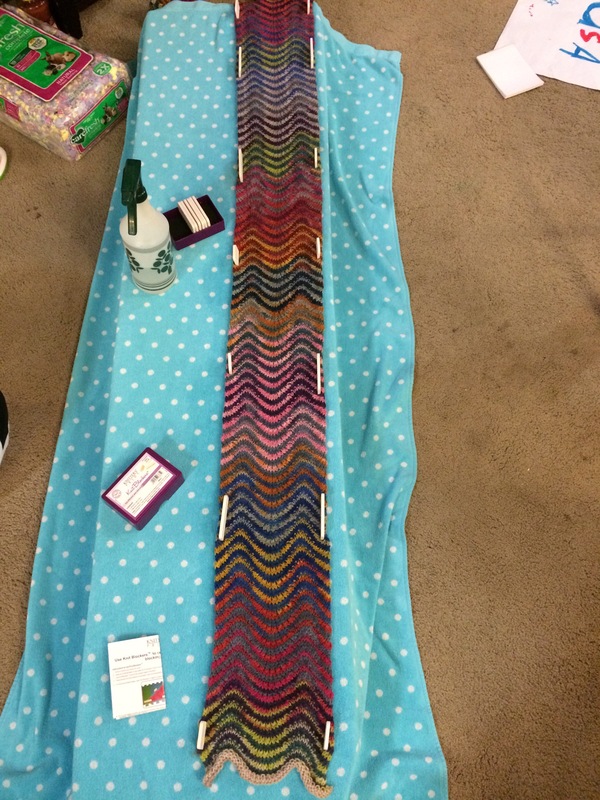 It took about 3 skeins of the light tone (color 7804) and 3 skeins of the dark tone (7898). It’s a really long scarf. I also have a shower to go to next weekend for a dear friend’s baby boy. Well there’s nothing I love more than knitting baby hats, so I also started, and finished a baby hat this weekend. I watched a Lynda course about design and by the time it was done my yarn had become a hat! I have found that I can learn from those online courses if my hands are busy while I’m watching. It alleviates some of the tedium. I’ve yet to be brave enough to bring knitting to a meeting filled day at work, but I bet it would work in person too. Sadly I think knitting at work is at best weird and at worst rude. 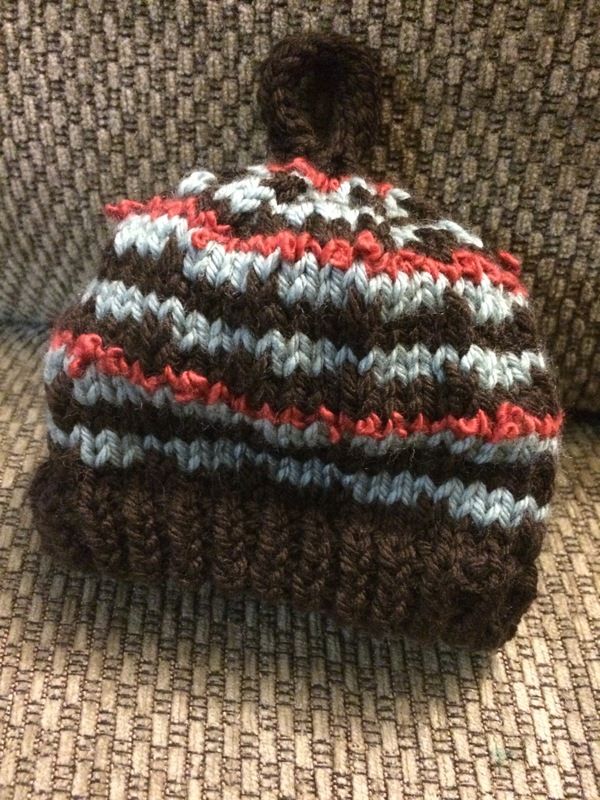 This pattern is a modification of the Magic Coffee Baby Hat pattern. I used three Debbie Bliss yarns; the brown and blue are cashmerino aran (300008 and 300005) and the red is cashmerino astrakhan (31006) which is a yarn with a little texture to it. The cashmerino yarn makes the hat both not-itchy and machine washable, critical for a baby. I did a slip stitch on the fourth stitch of the brown row to make the brown bump in the blue stripe. I think it’s cute and should be a great first hat for a September baby. We are supposed to bring a book instead of a card to this shower, and as the book lover in this group of friends, I picked out the books for three of us. 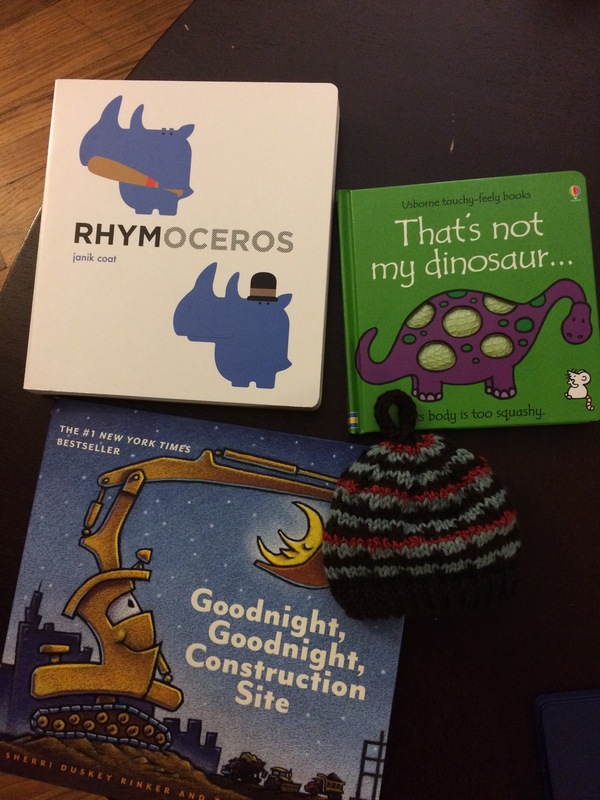 I’m like a kid’s book personal shopper. I love all three of these books. The hat is included in the picture so you can see how teeny tiny it is. What a productive weekend! Now I just have to wait two months for anything I created to get worn. The best part is, now that I’ve finished two somethings, I can start something…or tackle that sweater that was under the scarf in the knitting basket. Just one more sleeve! Maybe I can get it done before winter.